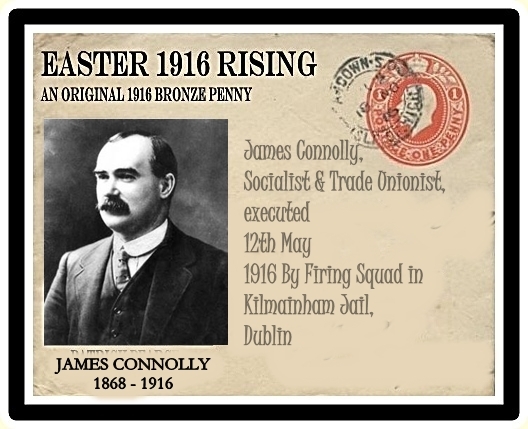 was an irish Republican & socialist leader. He was born near Edinburgh, Scotland, to Irish parents. He left school for working life at the age of eleven, but became one of the leading Marxist theorists of his day. He also took a role in Scottish & American politics. of the leaders of the 1916 Rising. Ireland Easter 1916 Commemorative Cards. Card Size 6X4.inches Each card is laminated & contains an original 1916 KG V penny coin (of the period) attractive cards Ideal for framing. .These Cards can be purchased individually using the paypal shopping cart buttons, please choose & then click on the paypal button to the Right of each item, Selling @ £6.95 Stg each + 75p S/H) or buy the lot @ £44.95 & avail of Free insured Registered Postage -Anywhere in the world. was a political activist, poet, playwright, educationalist and revolutionary leader. 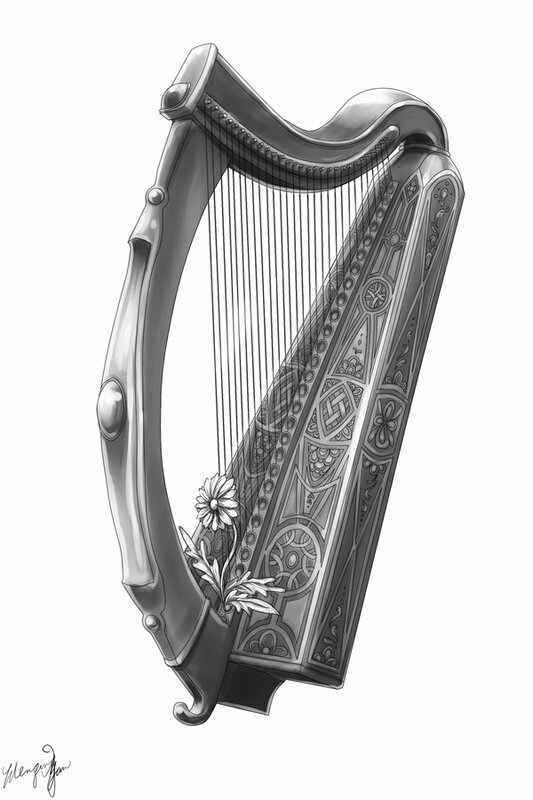 He was one of the seven leaders of the the Rising. was an Irish political activist and revolutionary leader. One of the seven leaders of the 1916 Rising ,which he helped to organise as a member of the Military Committee of the IRB. Also a signatory of the Proclamation . on the 12th May 1916.
was an Irish nationalist, poet, journalist, and a leader of the 1916 Rising. 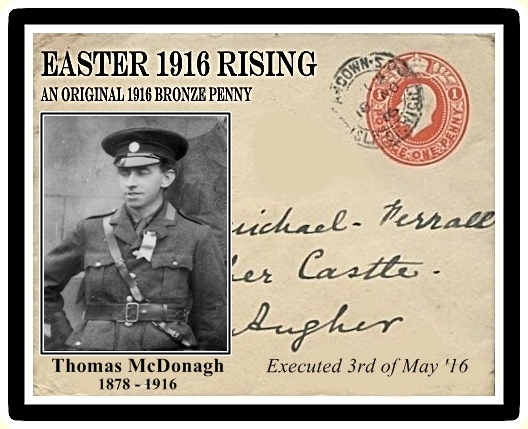 He was executed for his part in the Rising on 4th May 1916 aged just twenty eight. Ceannt was born in East Galway in the town of Ballymoe. He spent his first few years in the town barracks where his father, James Kent, was stationed as an RIC officer. When his father retired from the force, the family moved to Dublin. It was there, in the O’Connell School, that Éamonn Ceannt took his first steps on the road to becoming a nationalist .He was executed 8th May 1916. Paypal gift Certificate Button Click Above link to Send a Unique Gift!